While Thomas had been in Australia, Elizabeth and their family of five children had returned to Sheffield where her family no doubt provided a degree of security. However, it appears that she was determined to maintain an independent life and to provide direction and a secure future for her children. 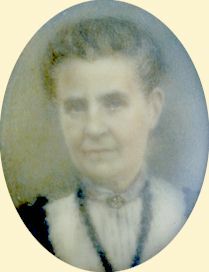 By 1881 she had established herself as a dealer in glass and chinaware and was living independently with the family at 16 South Street, Sheffield - although her youngest daughter's presence as a visitor with her grandparents shows the to-be-expected close connection with the extended family. It is not known whether this small business prospered, but it does appear that by personal determination and enterprise, the financial support that Thomas was able to send and the security of her wider family, Elizabeth was able to hold her family together, to provide an education for each and to consider how best to launch them in their respective careers. In March 1885, only three months after the death of her mother, came the death of her father at the age of 85. Henry Styring had operated as an estate agent in Sheffield for about 46 years until his retirement at which time it was continued by his sons - first Henry Ashmore Styring and then William Thomas Styring. An early injury to his arm which had left it deformed, further emphasised his small stature and the frailness of his health. Despite these setback, Henry had lived to a good age and, in whatever spare time he had from his profession, had farmed 12 acres with some help from an occasional farm man, in the centre of the estate park of the Earls of Shrewsbury, where they lived. This enterprise had provided most of the food for his family. The family also benefited greatly from the dedication of his thrifty, industrious wife, a trained dressmaker. As a result of this industry and thrift, Henry left a fortune of some £30,000. Under his will Elizabeth, as well as each of her four sisters was to receive one fifth of the income from a fund of £15,000. At the time of her husband's unexpected death in Australia in 1886, their five children ranged in age between 12 and 18 years - obviously a critical time in their lives. Neither Elizabeth or her children were to fail the test - although perhaps Elizabeth's early aspirations for them were not as ambitious as it eventually proved was possible. By 1891, Elizabeth and four of her children - her daughter Elizabeth was away at college - had moved to 5 MacKenzie Court in Eccleshall Bierlow. Frances, the youngest was still at school but we now can begin to track each in their career and eventual family life. Henry Styring Nutt - was 23 by the time of the 1891 census and can be found living at home with his mother, having established himself as a saw marker. This occupation, which involves the responsible task of marking-up the rough timbers before cutting, had undoubtable followed a full apprenticeship and a demonstration of promise and ability. However, early in 1892, Henry married his cousin Alice Mary Pratt, daughter of Thomas Nutt's sister and her husband William Henry Pratt, an engineer. This appears to have provided the impetus for a change in career direction as he was soon to establish himself as a self-employed coal merchant. The couple had three children, one of whom died young and none of whom married. It is this family that preserved the diary for over eighty years - which is perhaps not surprising, given that both of the parents were directly related to the diarist - and it is their home where the diary was found fortuitously when being cleared after the death, in 1978, of Dorothy Nutt, the last of that line. William Harwood Nutt - was also living at home at the time of the census in April 1891. He was then aged 22 and was then working as a joiner, having also been encouraged to take the "learn a trade" route and to serve an apprenticeship. This relatively stable position makes what happened and what was achieved by this man all the more remarkable. For a man with these practical skills, a strong Congregationalist zeal and an extreme sense of need for adventure there was a particular step that could be taken - in 1892, William was appointed as a artisan assistant missionary with the London Missionary Society in the Central Africa Mission. In the same year, he left England and arrived at Fwambo near the southern tip of Lake Tanganyika in what was then Northern Rhodesia and is now Zambia.The Society had started to build schools there and at Kambole in 1889 and, as mission activity took hold, such schools began to spread throughout the country. William's practical skills and enthusiasm would provide valuable contributions to progress here. A number of surviving letters home, written to his sister Elizabeth, show a strong bond of understanding between them - and, in their almost breathless pace, show the size of the task he was part of and the pressures and difficulties he faced. His time in Africa, which also took in a period in Kambole, lasted some four years but, by the end of this time he was suffering from the effects of illness, no doubt of the type which would have been almost inevitable for a European facing the tropical hazards that were endemic. In 1898, he returned to England on medical advice. His subsequent resignation from the London Missionary Society was, presumably, followed by a period of recovery during which he determined on a further ambition; no doubt, as a result of his experiences in Africa, he decided that he wished to become a doctor. With limited means and a relatively unpromising academic background this was an extremely challenging objective. Nevertheless, by his determined application as well as on merit he graduated with an MD from Edinburgh in 1904. It was perhaps characteristic of his self-challenging attitude that he then chose to specialise in the field of radiography - the medical application of x-rays. This was a very new field of medicine; Wilhelm Conrad Roentgen had discovered x-rays in 1895 and it was soon widely realised that they could be used for both diagnostic and therapeutic applications although it took several years before standard techniques were developed - a text book on chest radiography, for instance, was not produced in English until 1905. In this evolving field, Dr Nutt would have been operating as a pioneer and there were dangers there that were not fully understood or realised. X-ray machines at this time lacked the protection and the accompanying exposure standards that are now considered essential and the practices often resulted in harm or even death. From 1896, when x-rays began to be used medically, up to 1903, the year before William graduated, fourteen operators had already died from over exposure. It seems that, early in his career Dr Nutt accepted a position at a hospital in the Wolverhampton area, as it was there. early in 1908, that he married his wife Ethel Towers Minors who, it appears, was probably working on the nursing staff. Ethel was the eldest daughter of William John Minors, a Wolverhampton seed merchant who was, in turn, the son of a Staffordshire farmer. Ethel's mother, who had died in 1891, was the daughter of Henry Coley, a major manufacturer of trunk locks - at its height, his firm was employing 80 or more persons. The full dangers of working with x-rays were appreciated only gradually during William's career and in less than twenty years, despite taking all the then-known precautions, he had developed radiation burns, particularly to his hands. In fact, he did make a major contribution to the safety of himself and others working in this field as he has been credited with the invention of the leather, lead-lined protective apron. By 1922, his illness had become advanced and it was decided that a sea voyage would be beneficial. The opportunity to sail with SS Norfolk to Australia as the ship's doctor presented the perfect opportunity to combine the suggested treatment with continued employment. The ship reached Australia at the end of May 1922 and, finding himself with several days of leave, he decided to try to put to rest the worries and doubts about his father's death in Silverton, that had lingered within the family for some 36 years. He set about finding what evidence remained with characteristic thoroughness. Travelling by train and motor car into and around the outback, to Silverton and Broken Hill, he made an emotional visit to his father's grave and sought out anyone who might have any memories of his father's time there, his sudden death and the vagaries of mining fortunes made and lost. He found William Maiden in Adelaide and in Melbourne he was able to interview a senior official who had managed the old Central mine for Sulphide Corporation as well as, most significantly, Fitzgerald Snowball, by then a man in his seventies. Despite the passage of time, Snowball recalled the events which followed his old friend's death when he had attempted to protect his interests for the sake of his family back in England. His description of how, with no authority forthcoming from the family he had been frustrated in his endeavours, clearly put the events of that past, unfortunate episode into true perspective. On the voyage back to England William wrote an account of his journey of discovery for his mother and the family which set out his clear conclusions. What had happened to his father all those years before had been bad luck on a grand scale but, the death aside, was not untypical of the outcome of mining ventures at that time when few made a fortune. Yes, there had been a chance that things might have worked out well and, when this looked likely, there had been attempts by other to take advantage, but his friend Snowball had done everything he could to protect the family's interest. In the end, it had been the lack of authority to act that had deprived the family of the chance of a fortune - but even that would have required precise timing. It seems likely that the visit and these conclusions did much to end the doubts that had lingered for so long. Towards the end of his life, William and his wife retired to Bournmouth where he died in 1943 at the age of 74. Elizabeth Styring Nutt - made a major contribution to art education as well as achieving a lasting status in the world of painting. Elizabeth was born in 1870 at Onchan on the Isle of Man, soon after her parents arrived there to make a new start. As we have seen, things did not turn out well there and eventually her father left for Australia and the rest of family returned to Sheffield where her mother's family were well established. Again as we have seen, her father, died tragically in Australia in 1886 when Elizabeth was about 16. Disruption and setback at this age can often blight a life but, with the support of a strong mother and the wider family, it is clear that this was not the case with Elizabeth. It was evident from an early age that her future lay in the field of art and, crucially, this talent was encouraged by her determined mother. After two years, from 1890-1891, at the Oxford Training College she went on to train at the Sheffield School of Art, probably with the benefit of a scholarship. Her time there brought her into contact with a number of fellow students who were each to go on to achieve lasting recognition in their field of art - the sculptor Charles Sargeant Jagger, the illustrator W Smithson Broadhead, who found fame in America as a horse painter, the portrait artist David Jagger, whose portrait of Robert Baden-Powell is amongst his most well-known works, the painter Frederick Varley, who would be one of many who went from Sheffield to find a new artistic freedom in Canada and, above all, the energetic, gregarious and witty Arthur Lismer - who would turn out to make a critical contribute to Elizabeth's career. While at college, she displayed the discipline, application and dedication to work that would be her hallmark throughout her life, at least once, ironically with almost tragic consequences - on several occasions, absorbed by her work, she had continued in her task after the closing time of 4pm, oblivious of pleas to leave. Eventually, she faced the discipline of the principal who, after first telling her that if she could not obey the rules she would be expelled, withdrew the threat after Elizabeth agreed to observe the closing time limit - a sensible outcome that probably saved an illustrious career. It seems that after leaving college, she taught school - certainly at Higher Grade School, Liverpool by 1895 - and this may well have provided the means for the next steps in her artistic development. The years that followed included study at Newlyn School of Art, founded by Stanhope Forbes and his wife Elizabeth Stanhope Forbes in 1899. It also included travel to the great European cultural centres for further study - there was time in London, a scholarship took her to Sorbonne in Paris and, for two years she studied with Professor Simi in Florence, Italy. Returning to Sheffield, she took up a post as headmistress of the Firs Hill Branch School which was affiliated to the Sheffield School of Art. In this period she also taught at the Sheffield Teacher Training College. 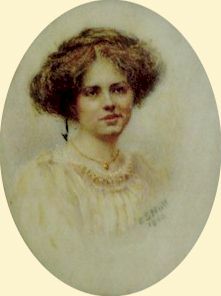 Her artistic reputation was growing; she exhibited regularly and, in 1908 a miniature portrait by her was accepted for exhibition at the Royal Academy and her work was exhibited regularly at the Sheffield Society of Artists and elsewhere. Also during this period, she made regular contributions to The Schoolmistress and to Arthur Mee's Children's Magazine as well as other publications for children and relating to art education. In 1916, she published Flower Drawing with the Children. She was awarded the Fine Art Diploma from the University of Sheffield and a thesis on the teaching colour gained her a Fellowship of The National Society of Art Masters of Great Britain - one of only nine at the time. This was a time when many Sheffield artists looked to Canada for a new vision and a new freedom, In 1911, Arthur Lismer who had been her contemporary at art college, having struggled to make a living in Sheffield, is said to have chopped up his office desk, made a travel trunk and set off for a new start in Canada. This move went well, so well, that in the following year he returned to marry his fiancee who he had left behind and returned to Canada with his bride. Frederick Varley was another contemporary who followed him to Canada and they were to be come two of the Gang of 7 who made their mark on Canadian art over the years that followed. In 1916, Lismer accepted the position of Principal of Victoria School of Art and Design in Halifax, Nova Scotia. It found it in a sorry state, housed in decrepit conditions on the top two floors of a drafty wooden building. He found only 12 enrolled students and a management that had little ambition for progress for the department. Releasing that he had found his true vocation in teaching, he set about changing things and, despite the impact of the war years, had grown student numbers to 72 by 1917 and had 25 scholarships to offer by the following year. The Great Explosion that rocked Halifax on 6th December 1917 when a ship blew up in the Harbour - still the world's worst ever - was a disaster for the population, coming as it did in winter. The college was badly damaged and an exhibition of Canadian art borrowed from other centres in the country was damaged along with it - but, of course, this was insignificant in the wider devastation in which 1962 people were killed and 20,000 homeless. Things were once more at a low ebb at the collage. In 1919, Lismer accepted the Vice-Principalship of Ontario College of Art and left Halifax in August of that year. His recommendation had been that the college should hire Elizabeth Nutt and, indeed, had written to his father saying, "Tell Miss Nutt to come out to Canada" - and when the official invitation came she accepted the position of Principal immediately, expressing herself attracted by the opportunity for freedom to try her own methods. Some who knew found Lismer's choice a curious one - although the two were contemporaries - although at 49, Elizabeth was some 15 years older than Lismer - they shared a passion for art education they were also opposites in much more - Lismer's methods involved a freedom of expression and creativity which contrasted with Elizabeth's teaching philosophy which, while "new", had a rigidity and discipline not seen in Lismer's approach. However, in fact his was a shrewd choice; perhaps he saw that the discipline in Elizabeth's works was also reflected in her personality and that brought determination - exactly the qualities needed to ensure that art education in Halifax was to flourish. Elizabeth arrived in Halifax in October 1919 and found conditions at the college even worse than she had expected - everything - accommodation, materials and funding were scarce. She had no time to complain but started immediately to put things right - starting with a recruitment drive for students, teacher training and new staff. As Lismer was to recall it, "She raised Hades, carried her mannish umbrella like a weapon, banging it on a convenient table when roused, got a lot of thing done, and stayed triumphantly in the job for twenty-five years". In those twenty-five years, she transformed the place, and in the process raised the awareness of art in Halifax, the Maritime Provinces and throughout Canada. She was tireless in her efforts to raise funding through scholarships - one being in honour of her mother - and bursaries from government, business and from the local social elite. An eloquent and forceful speaker, she harnessed those talents to raise the awareness of and interest in art in a wider public and to raise support for the School, finding a particular resonance with women's groups. Several times, her industry saved the School from financial collapse. In 1925 she saw through a change of name for the School to become Nova Scotia College of Art, backed by a legislative Act. The motto for the College, written by Elizabeth - "Membership of Heart and Head and Hand" - reflected her belief that the combination of all three represented the fullness of life. Elizabeth was Principal at the College for nearly 24 years. In all that time she never stopped painting and exhibiting and was very active in extending the appreciation of art. In 1922 she became a founding member of the Nova Scotia Society of Art and was its President from 1930-1932. Later, in 1934, she involved herself in the formation of the Maritime Art Association in 1934 and was the first President of the Nova Scotia Society of Water Colour Painters when it was formed in 1936. In 1931, another Sheffield artist, Stanley Royle arrived in Halifax to take up a position at the College. By the time Elizabeth had left Sheffield, Royle had become a leader of the art communities in Sheefield and Leeds and his growing reputation throughout the following decade had enabled him to make an increasing living from art - a trend that had begun to reverse when the debression bega to bite. Elizabeth, of course, knew Royle well and they had painted and sketched together during Elizabeth's regular visits to Sheffield each summer. While initially, the working relationship between Elizabeth and Royle was good, things began to become a little strained as factions developed supporting one or the other's style. Elizabeth's rigid technique had become a little dated to the more progressive amongst the students and the amongst the wider art community in Halifax. However, through all this she still retained a strong following of her own and continued to serve the best interests of the College as she saw them. By 1940, when she was aged 70, Elizabeth's health began to fail but she continued until May 1943 when, too ill to continue, she tended her resignation. The Board's tribute acknowledged the massive contribution she had made. speaking of ",, the unselfish zeal for her subject, and her strong and fine character, (which) soon became manifest in the College, which she revolutionized, and turned into a centre of intense activity". For her own part, she regretted only that she had not been able to move the College to a new building - but that had not been for lack of trying. The wartime conditions delayed her return to England but she finally was able to leave in September 1945 on the Duchess of Bedford. She died at her sister's home in Sheffield on March 25 1946. Ernest Smith Nutt - was Thomas and Elizabeth's fourth child , born at Onchan, Isle of Man in 1873. He was thirteen when his father died, but again thanks to his mother's determination and his own hard work, had become an elementary school teacher by 1891. It seems, though, that by a few years later he was operating as a self-employed coal merchant, possibly in partnership with his eldest brother. However, his 1897 marriage to Gertrude Glover Boswell, the eldest child of Albert Boswell, the Managing Director of a Sheffield file and cutlery manufacturer, changed his future completely; by 1901 he was still operating his coal business but it was clearly taking second place to his new career - he had joined his wife's father's business as Company Secretary. - Albert Boswell Nutt, became a Consultant Opthalmic Surgeon to the Sheffield area hospitals. - Isabel Nutt married William Luther Rowe, a consultant Ear, Nose & Throat surgeon in Sheffield. - Ursula Nutt who married John Duncan Gray. Frances Helen Nutt - was Thomas and Elizabeth fifth and youngest child, born in Onchan, Isle of Man in 1874. She married Bernard Peel Carlisle in August, 1899 at Mount Zion Congregational Church, Sheffield. Bernard Peel Carlisle (1874-1955) was an ivory merchant, in the family business of Carlisle Brothers, the son of John Lawton Carlisle, grandson of Charles George Carlisle and great-grandson of John Carlisle. Virtually all of the sons of these generations, extending back to the early 19th century, had been engaged in Sheffield in the making of table knives, evolving into ivory cutting - mainly for cutlery handles and piano keys. In the mid 1870s, the firm had been approached by William Lockwood, looking for financial backing for a steam piston ring that he had invented. The partners were not impressed with his restless nature, and offered to buy the invention from him, he had agreed and, as a result, Lockwood & Carlisle had been established in 1876 and had grown steadily with the increase in steam reciprocating machinery for merchant shipping. Both Carlisle Brothers and Lockwood & Carlisle became limited companies in 1898, following the death of William Lawton Carlisle. His eight children then became the equal shareholders in each business. His sons, William Lawton Carlisle, Charles Lawton Carlisle and John Lawton Carlisle ran the ivory business, and their brothers, Henry and Percy, became involved in the piston ring activity. Lockwood and Carlisle expanded steadily and produced piston rings for many famous liners, including the famous steam ships Olympic and Titanic. The low-pressure piston ring diameter for these engines was 97 inches in diameter! During the 1939-45 war, every Liberty and Victory ship built - many in the USA - had L&C piston rings fitted; these ships constituted the backbone of the merchant navy at that time. Many Royal Navy corvettes, frigates and minesweepers also used them. Carlisle Brothers continued to trade successfully, with the principals making twice-yearly visits to Antwerp to buy ivory, which generally came from the Belgian Congo (now Zaire). However, by 1938, the use of ivory in cutlery manufacture had declined and the firm went into voluntary liquidation. John Hugh Carlisle (1900-1958) was born in Sheffield and married Lilian Amy Smith, also from Sheffield, in 1926. By the time he had assumed the management of Lockwood & Carlisle after the war, diesel engines had become dominant for merchant shipping, and steam engine use had inevitably declined - the last steam engine rings were made in 1970. In response, John Hugh made significant changes to the works in Stalker Lees Road, installing machinery for the production of diesel engine piston rings. Following his premature death, aged 57, responsibility fell on his son Michael, who had trained as a marine and mechanical engineer. His metallurgical and business training helped to widen the product range of the Company, and by 1976, the company centenary year, piston and cylinder cover reconditioning had become a major activity. The decline in the UK owned merchant fleet led eventually to the disposal of the marine engineering companies to private Dutch interests. - his son, Michael Carlisle, remained involved throughout this period of change but also became substantially involved in public life as well as non-executive directorships. He was involved with the National Health Service for over 30 years, and served as Chairman of Trent Regional Health Authority from 1982-94, as well as being Chairman of the Regional Chairmen in 1991-2. He was knighted in 1985. He was also a member of Council of the Medical Research Council, and a member of Council of the University of York since 1990 and was its Pro-Chancellor from 2000-06. William Harwood Carlisle (1906-1979) was born in Sheffield and married Joyce Williams, also of Sheffield. He studied medicine and became a Fellow of the Royal College of Surgeons (Edinburgh) with a gynaecological certification, which was turned into a Fellowship of the Royal College of Obstetrics and Gynaecology in about 1968. Most of his practising life was spent in Wisbech, Cambridgeshire, where he was known for his dedication to his work and also to the community as a whole. On retirement he was given the Freedom of the Borough. - firstly, Elizabeth Ann Carlisle born in Sheffield for reasons of sentiment, subsequently was educated at Hunmanby Hall, near Filey, and then attended secretarial college in London. In due course this led to a role as P.A. at chairman level for many years. Eventually she returned to her roots in Wisbech and became involved in the community. She was a member of the Town Council for many years and was and served as Mayor in 1981-2. Subsequently she became a member of Fenland District Council and served as Chairman for three years. She became a JP and serves on many voluntary bodies. - his elder son, Hugh Bernard Harwood Carlisle, was educated at Oundle and subsequently read Law at Cambridge (Downing College). He became a QC in1978 and a bencher of the Middle Temple in 1985. He appeared in many high profile personal injury and health and safety cases. He was chairman of the Hurlingham Club in 1982-85. The author acknowledges the invaluable contribution made by Sir Michael Carlisle, Martin Gregory Nutt, Elizabeth Ann Carlisle and other descendants of Elizabeth Nutt Harwood, who have co-operated enthusiastically and given access to surviving family papers and research in their possession.